Trust is central to the doctor-patient relationship. Higher trust predicts better treatment adherence and healthy behaviors (Berry et al. 2008; Safran et al. 1998; Thom, Hall, and Pawlson 2004), and distrust of providers among vulnerable populations could exacerbate existing gaps in health. Studies show that trust varies across population subgroups, including by race/ethnicity, gender, and educational attainment (Armstrong, Putt, et al. 2013; Armstrong, Ravenell, et al. 2007; Boulware et al. 2003; Hughes-Halbert et al. 2006). This QuickTake builds upon those studies, using data from the September 2016 Health Reform Monitoring Survey (HRMS)1 to explore variation in trust by patientsâ€™ demographic, socioeconomic, and health characteristics. Survey respondents were asked to rate their trust in the doctor or other health care provider they see most often for their health care on a scale of 0 to 10, where 0 indicated that they did not trust their provider at all and 10 indicated that they trusted their provider completely.2 Of the 4,107 nonelderly adults included in the analysis,3 35.3 percent gave ratings of 7 or 8, the median response category; 25.4 percent gave ratings below the median (0 to 6), and 39.3 percent gave ratings above the median (9 or 10; data not shown). 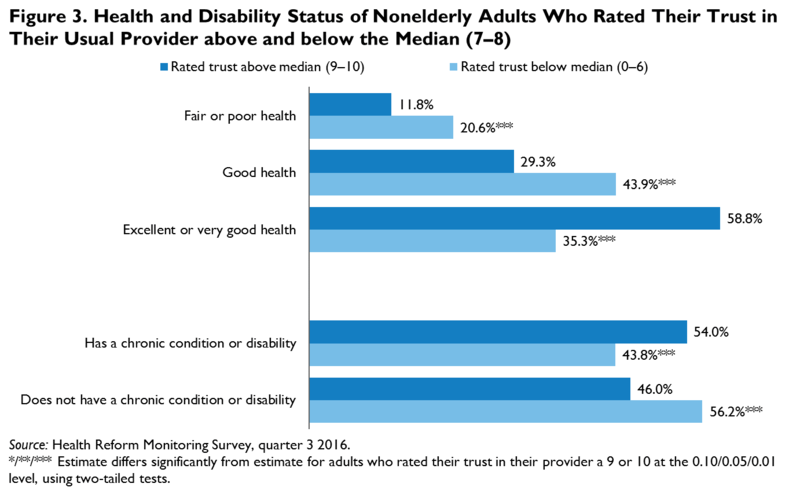 We compare the demographic, socioeconomic, and health characteristics of adults who rated their trust in their usual provider above and below the median response category of 7â€“8. Adults who gave trust ratings below the median category of 7â€“8 were more likely to be young and Hispanic or nonwhite, compared with adults who gave ratings above the median (figure 1). 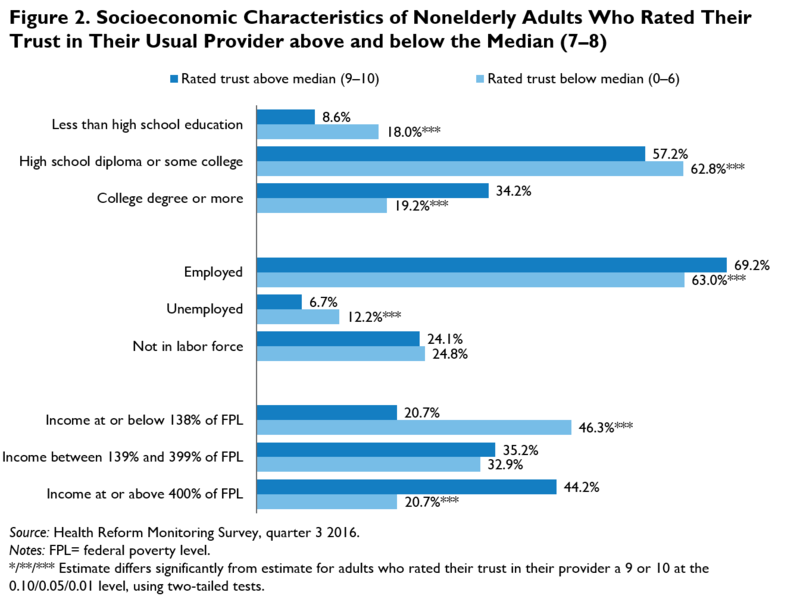 Those who rated their trust in their provider below the median also tended to have fewer economic resources: adults who gave ratings below the median were more than twice as likely to have family incomes at or below 138 percent of the federal poverty level (FPL) as those who gave ratings above the median (46.3 percent versus 20.7 percent; figure 2). Consistent with this income difference, adults who gave trust ratings below the median were less likely to have a college education and more likely to be unemployed. Adults who gave ratings above the median and adults who gave ratings below the median also differed by the presence of health problems (figure 3). Adults who reported above-median trust in their provider were more likely to say their health was very good or excellent than those who reported lower trust (58.8 percent versus 35.3 percent). Those reporting higher trust were also more likely to have a chronic condition or disability; this may reflect the higher stakes of the patient-provider relationship for adults with health problems, as well as their more frequent interactions with their providers. 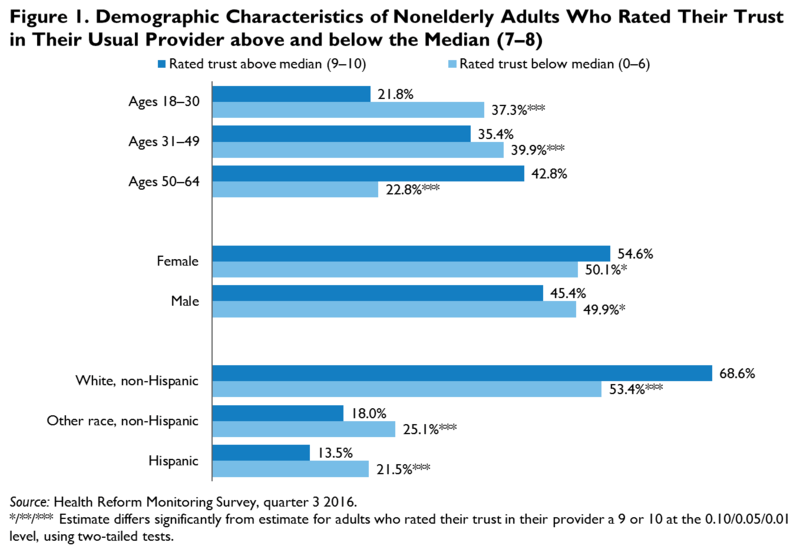 Although most adults reported relatively high trust in their usual provider, many of those who reported low trust were disadvantaged. Respondents who gave trust ratings below the medianâ€”roughly one in four adultsâ€”were more likely to be members of a racial or ethnic minority, to have more limited economic resources, and to report fair or poor health, compared with their counterparts who gave higher trust ratings. Distrust of providers likely interferes with patient-provider communications and could exacerbate health care problems for these vulnerable groups. Armstrong, Katrina, Mary Putt, Chanita Hughes-Halbert, David Grande, J. Sanford Schwartz, Kaijun Liao, Noora Marcus, Mirar Bristol Demeter, and Judy A. Shea. 2013. “Prior Experiences of Racial Discrimination and Racial Differences in Health Care System Distrust.” Medical Care 51 (2): 144–50. doi:10.1097/MLR.0b013e31827310a1. Armstrong, Katrina, Karima L. Ravenell, Suzanne McMurphy, and Mary Putt. 2007. “Racial/Ethnic Differences in Physician Distrust in the United States.” American Journal of Public Health 97 (7): 1283–89. Bart, Lea, and Sharon K. Long. 2017. “QuickTake: Many Patients Who Struggle to Pay for Health Care Don't Trust Providers to Tell Them the Costs of Treatment Options.” Washington, DC: Urban Institute. Berry, Leonard L., Janet Turner Parish, Ramkumar Janakiraman, Lee Ogburn-Russell, Glen R. Couchman, William L. Rayburn, and Jedidiah Grisel. 2008. “Patients’ Commitment to Their Primary Physician and Why It Matters.“ Annals of Family Medicine 6 (1): 6–13. doi:10.1370/afm.757. Boulware, L. Ebony, Lisa A. Cooper, Lloyd E. Ratner, Thomas A. LaVeist, and Neil R. Powe. 2003. “Race and Trust in the Health Care System.” Public Health Reports 118 (4): 358–65. Hughes-Halbert, Chanita, Katrina Armstrong, Oscar H. Gandy, and Lee Shaker. 2006. “Racial Differences in Trust in Health Care Providers.” Archives of Internal Medicine 166 (8): 896–901. Long, Sharon K., and Lea Bart. 2017. “Do Patients Trust their Providers?” Washington, DC: Urban Institute. Safran, Dana Gelb, Deborah A. Taira, William H. Rogers, Mark Kosinski, John E. Ware, and Alvin R. Tarlov. 1998. “Linking Primary Care Performance to Outcomes of Care.” Journal of Family Practice 47 (3): 213–20. Thom, David H., Mark A. Hall, and L. Gregory Pawlson. 2004. “Measuring Patients’ Trust in Physicians When Assessing Quality of Care.” Health Affairs 23 (4): 124–32. This QuickTake is part of a series drawing on the HRMS, a survey of the nonelderly population that explores the value of cutting-edge Internet-based survey methods to monitor the ACA before data from federal government surveys are available. Funding for the core HRMS is provided by the Robert Wood Johnson Foundation and the Urban Institute. Lea Bart is a research assistant and Sharon K. Long a senior fellow with the Urban Institute’s Health Policy Center.